Happy St. Patrick’s Day, everyone! I’m not Irish in the slightest, but I’m a firm believer that holidays are meant to be celebrated by anyone and everyone. When I was younger I always looked forward to going to school dressed in green from head to toe and seeing what the “leprechaun” would leave me in my shoes during the night. 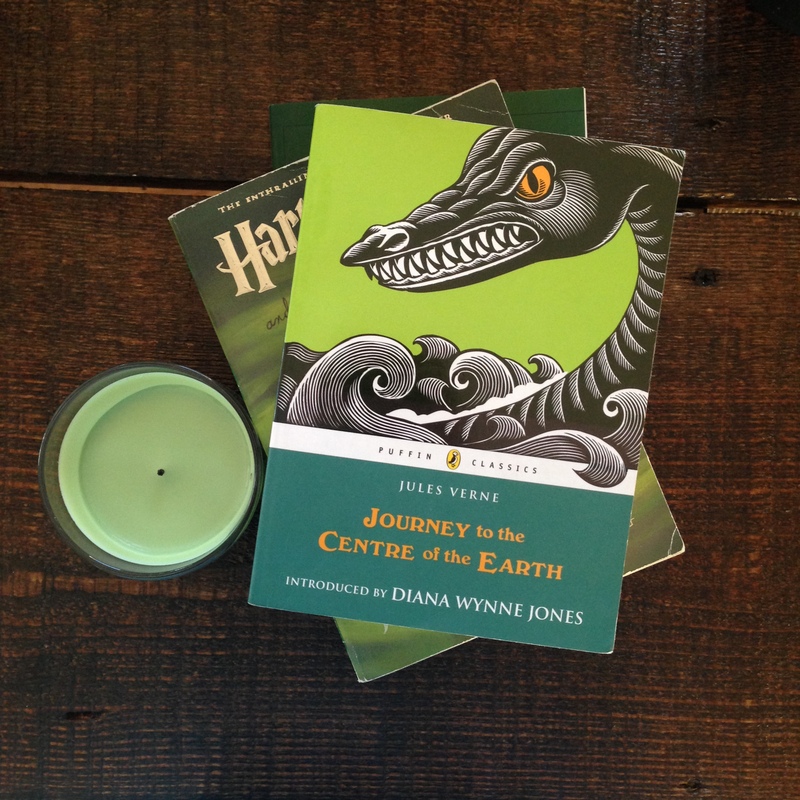 In honor of this special occasion, I thought it would be fun to share some pretty pictures of books with green covers. Finding a decent number of green books on my bookshelves was actually more difficult than I initially expected it to be (apparently I own many more blue books than green!) but in the end I managed to round up a fair amount. Harry Potter and the Half-Blood Prince by J.K. Rowling is probably my favorite book of the entire series. I love how dark and mysterious it is as well as how much information we learn about Tom Riddle, Dumbledore, and the inner workings of Voldemort lore in general. For me, it was when the driving plot behind the series really clicked into place. To be honest, I don’t even know why I’ve kept my copy of Journey to the Center of the Earth by Jules Verne for this long because I really wasn’t impressed by the story in the slightest. I read it years ago but distinctly remember thinking that the story was ridiculously illogical at times. I hated the awkward, shifting pacing of the plot and the ending was disappointingly lackluster. But just look at the gorgeous green cover! Nothing screams “SUMMER!” to me quite like The Outcasts of 19 Schuyler Place by E.L. Konigsburg, which I excitedly bought at a Scholastic Book Fair when I was in third grade. I’ve reread it countless times since then, taking something new away from the story with each revisit. Back when I was ten years old it was simply a summer camp story to me; now that I’m twice that age, I tend to notice the way the narrative arcs through time in subtle patterns. And there’s no denying that Konigsburg’s witty sense of humor gets better and better with each reread. I read the English translation of One Hundred Years of Solitude by Gabriel García Márquez over the summer and unexpectedly fell in love with it. The colorful green design of this edition perfectly suits the narrative’s basis on nature, passion, and the cyclical aspect of life. Last but not least, O Pioneers! 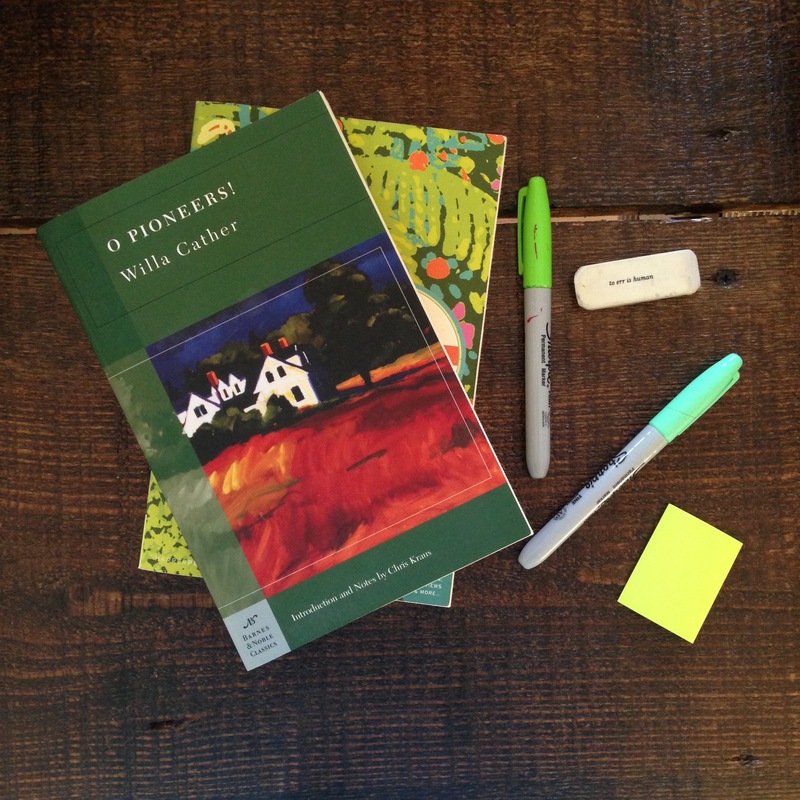 is the second novel I’ve read by Willa Cather. I decided to read it after I felt the void of having finished Cather’s brilliant book My Ántonia. Another one of her novels is currently eyeing me from my bookshelf as I write this and I can’t wait to finally get around to reading it soon. I hope you’ve enjoyed this little foray into my meager collection of green books. Happy St. Patrick’s Day!! What are your favorite books that are green? Do you celebrate St. Patrick’s Day? Let me know in the comments section below! I loved reading Tomie DePoala’s books when I was younger! While working in my town’s library in high school I stumbled across his shelf in the children’s room and took such a long trip down memory lane ❤ Happy St. Patrick's Day! I loveeeee the Harry Potter Series!! Some of my series of unfortunate events books are green! I don’t celebrate . But it seems fun. My favorite green book. maybe my B&N edition of Pride and Prejudice. 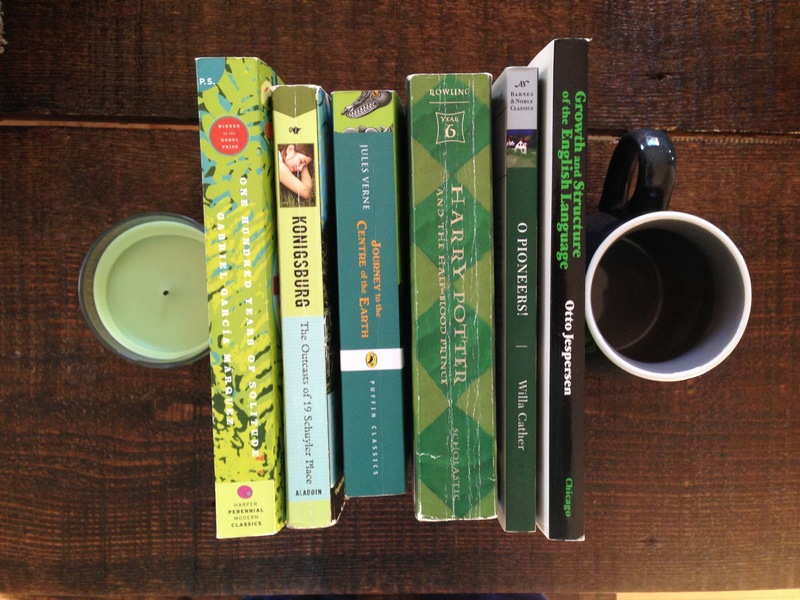 Green books are so pretty (love your pictures!)! I’m looking at my shelves now and I barely have any green books! I MUST REMEDY THIS IMMEDIATELY. I should have read Journey to the Center of the Earth ages ago 🙂 Jules Verne rocks. Wow, that’s an awfully good amount of books you’ve found with green on the cover. This is lovely! I really like the books you’ve chosen (aesthetic like whoa) and I neeeeed to read 100 years of Solitude!). Just loking at my shelf, I have Clariel, Wicked, Out of the Easy, and Inheritance, all with lovely green covers. I think besides Harry Potter, the only book with a green cover I own is I Capture The Castle. Nice post! 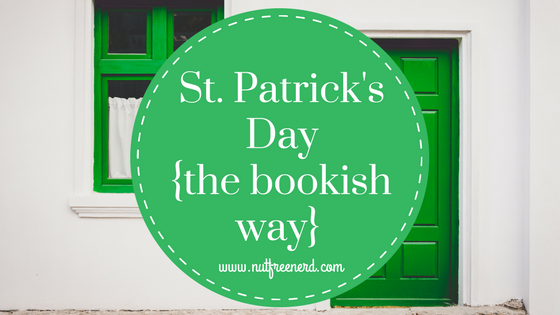 I didn’t do ANYTHING for St. Patrick’s day.😂Except post a photo of green books on bookstagram! Haha. I’m not Irish or Catholic so it doesn’t really mean anything to me tbh, but I do loooove green books. They’re so pretty.😍 I haven’t heard of any of the ones you listed though (shame on me!) But I do love Half Wild and Fangirl and Since You’ve Been Gone, which are all green!